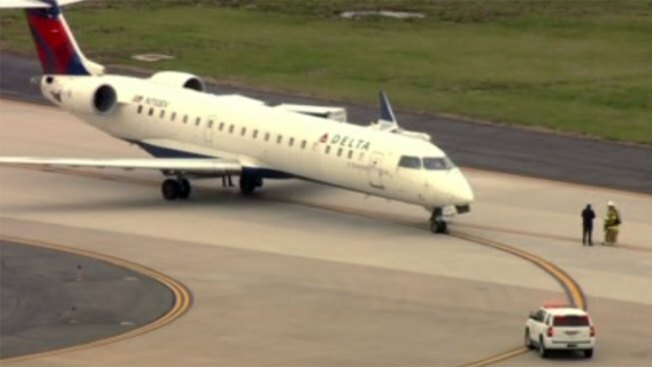 A Delta Express plane made a safe emergency landing at Dulles International Airport on Tuesday afternoon after losing a left front tire. Flight 5507 was en route to Richmond from LaGuardia Airport when the flight declared an emergency after the crew was notified they lost a wheel on takeoff, according to the Metropolitan Washington Airports Authority. Passengers said they got word halfway through the flight that they needed to make an emergency landing. "You just try to keep a brave face," said Mark Jenkins, who was on the final leg of a trip from England to Richmond. "There wasn't anything we could do," said passenger Megan Oley. "Just sit and pray. That's it." Anxiety surged as flight attendents prepared passengers for a potentially bumpy landing. "They mentioned the brace for impact. I'm not gonna lie. My heart jumped a little bit," another passenger, Joseph Zammito, said. But the landing went relatively smoothly, passengers reported. "It was the smoothest landing that I've had for a couple of years," Jenkins said. The plane was inspected after landing at Dulles. It was missing a main gear wheel. No damage fromt he landing was found, but the plane was listing at 45 degrees and was unable to taxi to the gate. Passengers were brought onto an airport shuttle, grabbed their bags and were boarded on a bus to Richmond. Also Tuesday, a Dallas-bound Southwest Airlines flight made an emergency landing in Philadelphia. The jet's left engine blew shortly after takeoff, NBC Philadelphia reported. A piece of shrapnel apparently flew into a window causing the glass to break. One person has died as a result.